This is a link to my my first ever project dealing with flash. 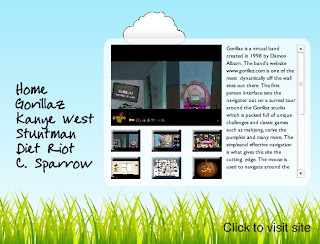 The goal was to make a mini site showcasing 5 other flash based websites which I thought were interesting. 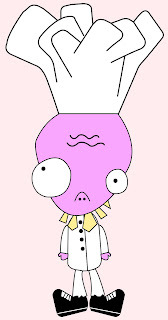 Gordon Ramsy's new rival Chef McKenzy. Another awesome creation brought to you by the one and only Salim R.
"Dystopia Area 52" is the last project from the the dystopia series. This is a 90 second still image movie based in the style off "La Jetée". The movie depicts a evil robot invading the space of Area 52 where green army men reside. I made this by taking photographs of a set I made in my back yard. Then scanned in the negatives on the comp once for the original pics. Then the negatives were scratched and scanned in again. Finally they were edited on photoshop to create the simple animation. There are two versions of the movie one in black and white which was made using the original and scratched negatives and then the colour version that is the same just with added colour thanks to photoshop. 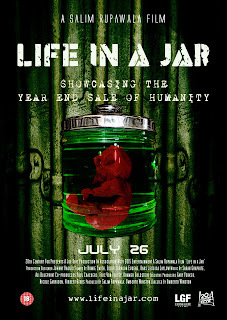 "Life in a Jar" is a film poster I designed for a fictional film. The intent was to create a unit of work which highlights the issues dealing with cloning, stem cells and the new era of science. For some neat O facts about this poster: the fetus was made out of clay and the background is a image of radiator pipes. First ever piece of Graphic Design! This is my first ever piece of graphic design. 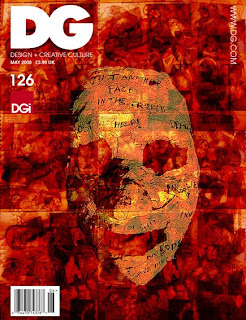 It is a magazine cover which relates to my personal identity. I made it using a cast of my face with images of me, and things I can relate with in the background. The aim was to show that we all hide behind a masks, but behind the masks lies a unique experience of life. Another intention was to portray that because of the masks we hide behind in our everyday lives we sometimes create insecurities which only exist in our minds. Pretty deep for a first project lol.